Linear, ssRNA(+) genome of 4.2 kb, which lacks a cap structure and a poly(A)tail. The virion RNA is infectious and serves as both the genome and viral messenger RNA. Two 5'-proximal ORFs are directly translated to produce the viral constituents of the replicase complex. RdRp is translated through suppression of termination at the end of ORF1. 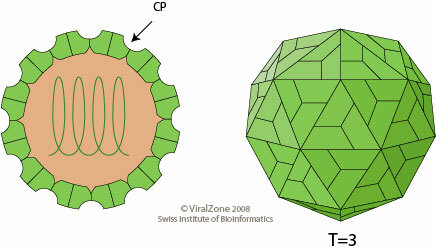 The downstream genes encoding the movement proteins and capsid protein (which acts as a viral suppressor of RNA silencing ) are translated from subgenomic RNAs. Cap-independent translation is mediated possibly through the interaction between a 3'-cap-independent translation element and a 5’UTR stem-loop. The RdRp recognizes internal subgenomic promoters on the negative-sense RNA to transcribe the 3’co-terminal subgenomic RNAs that will generate the capsid and movement proteins. TRANSMISSION Mechanical, plant contact, seed.